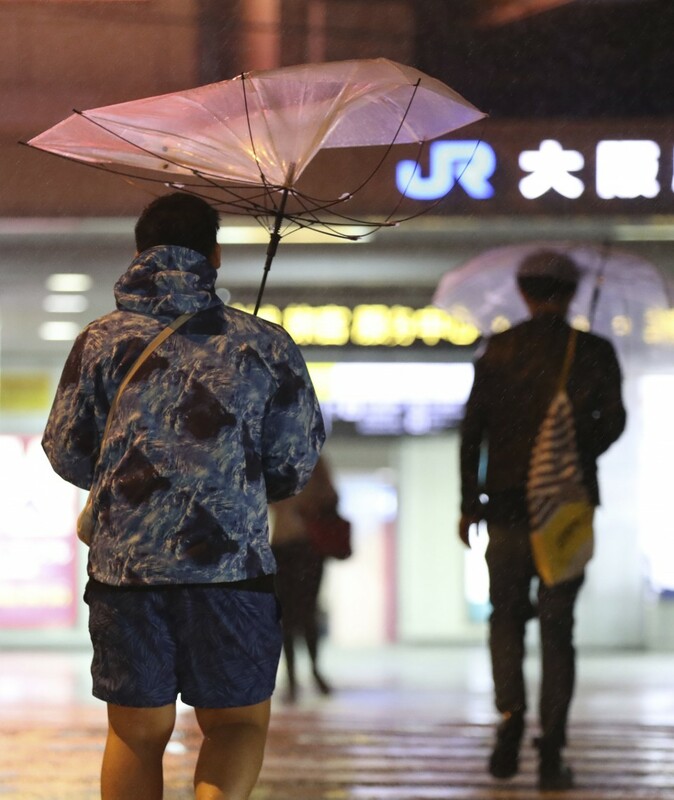 A strong typhoon hit the Japanese archipelago Sunday, injuring dozens and forcing public transportation operators to shut down their services early. Typhoon Trami made landfall in the western Japan prefecture of Wakayama around 8 p.m. and churned toward the eastern and northern part of the country, the Japan Meteorological Agency said, as it warned of high waves, stormy winds and rain across wide areas of the regions. A woman in her 60s went missing in Miyazaki Prefecture, southern Kyushu, after being washed away in an irrigation ditch, local police said. At least 82 people were injured in 16 prefectures, according to Kyodo News tallies. Evacuation orders and advisories were issued to over 3.8 million people in 23 prefectures as of Sunday evening, according to the Fire and Disaster Management Agency. East Japan Railway Co. shut down all of its train services in the Tokyo Metropolitan area around 8 p.m. The company said it was the first time it had stopped services early in Tokyo and the surrounding areas after informing the public of its plans beforehand. Similar measures were taken for some shinkansen bullet train services, with Central Japan Railway Co. stopping all shinkansen trains between Tokyo and Shin-Osaka after 5 p.m. Services between Shin-Osaka and Hiroshima as well as many local railway services in western Japan were also halted. 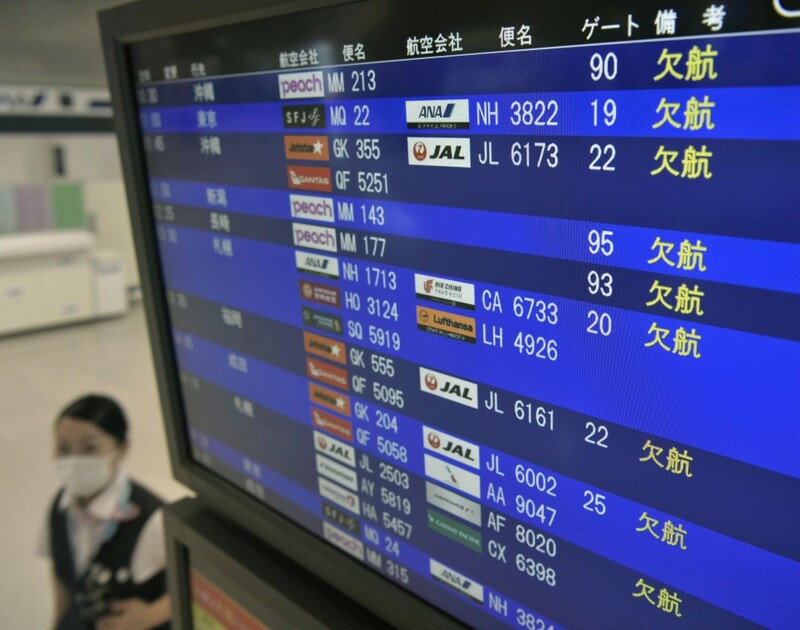 Kansai International Airport in Osaka, which was temporarily crippled by a typhoon earlier in the month, was closed and plans to reopen on Monday, the airport said. More than 1,000 flights have been cancelled, affecting over 100,000 passengers. Universal Studios Japan also shut its theme park in Osaka. The season’s 24th typhoon gradually picked up speed as it traveled through western Japan, moving at 60 kilometers per hour with an atmospheric pressure of 960 hectopascals at its center and packing winds of up to 216 kph, according to the Japan Meteorological Agency. More than half of the municipalities in Okinawa closed their early voting stations ahead of a gubernatorial election on Sunday, the prefectural election administration commission said. Japan has been hit by a series of typhoons this year, including Typhoon Prapiroon, which brought downpours and caused floods and mudslides in western Japan. On Sept. 4, Typhoon Jebi also flooded a terminal and a runway at Kansai International Airport, built on an artificial island, and caused a tanker to smash into and damage a bridge connecting the airport with the mainland, stranding thousands of people at the airport at one point.